Sakhigopal Temple is a highly revered shrine situated at Satyabadi which is about 22 km from Puri of Odisha. It is one of the famous ancient temples situated in route to Konark. Sakhigopal Temple resembles a miniature temple of Jagannath Temple at Puri. The temple enshrines a life size image of Krishna, standing with a flute, with Radha standing on the left side. The images of Krishna and Radha are very impressive. It is believed that the idol of Krishna was brought here by King Prataprudra Deva after his victory over Kanchi (South India). The annual fair held here on the Anla Nabami day in the month of Kartika attracts thousands of people from far and near. A popular belief among the devotees is that the pilgrimage to the Jagannath Temple at Puri would not be complete without a visit to this temple. There is a very popular legend behind the name Sakhigopal. Two brahmins of Vidyanagar of south India went Brindaban on piligrimage. There the elderly one fell ill and was attened very sincerely by the younger. The elderly one promise the other keeping Lord Krishna as witness that on reaching their native place he would offer his beautiful daughter to the younger in term of marriage. Unfortunatly when both of them reached their native place the elderly one expressed evasive replies. The younger one was assured that due to low status of brahmin caste he was misfit for his lovely daughter.Without delay he again went to brindaban and worshipped Lord Krishna.However in the long run Krishna agreed but he told that the brahmin would walk ahead and he would follow him,but the strict instruction was the brahmin should not look back,otherwise he (Lord Krishna) would remain then and there.Lord assured that the brahmin would hear the sound of Nupura(sweet sound producing bracelet used by dancers arround ankel).Lord followed the brahmin to vidyanagar. On the way they were to cross the river Godavari.Due to sand the feet of Lord were dipped and no sound from Nupura was heard.The brahmin was too restless and apprehensive to look back.Lord stood on sand and did not move.The brahmin immediately ran to Vidyanagar and called the local people in good numbers.all were stunned to see the statue of Lord Krishna of Brindaban.the elderly brahmin repented and attested his promise by giving his daughter in marriage to the younger one.The local king developed great devotion and constructed one temple then come there at the sopt and designated as ‘SAKHIGOPAL‘ . The Gajapati King of Odisha Sri Purusottam Dev brought the statue from Vidyanagar after the place eas conred by him (1467 to 1495). The King installed the statue at his fort at CUTTACK which was worshipped by Lord Chaitanya on his way to Puri. After muslim invasion the statue was shifted from place to plale by the Khurda chiefs and at last it was stationed at ALASA. It is told the other name of Sakhigopal is Alasa,but at present there is small village called Alasa near Sakhigoal. One Brahmachari raised huge donations and raised a temple (60 feet high) in 1860.Initially there was one statue of Krishna. At a later stage due to influence of Gita Govinda (written of Jayadev) people accepted the dual sculpture of RADHA KRISHNA,which is otherwise known as ‘JUGALMURTI’ and accordingly the King of Ranpur of Puri district offered one statue of Radha to have been conjugated with Lord Krishna. The height of Lord Krishna is 5 feet and that of ‘Devi Radha’ is slightly more than 4 feet. It is now also told during moonlit nights at the near by Bakulbana people have watched the glamorous love-play of Lord Krishna-Radha and Gopis. 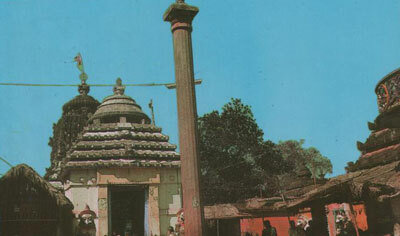 The temple is managed by Government of Odisha since 1939. Give Responses for "Sakhigopal Temple of Puri"